Turkeys remain the quintessential holiday employee gift. Always the star on the table at Thanksgiving gatherings across the country, turkeys are a welcome and appreciated gift. They are the perfect way to underscore how thankful you are for your employees’ contributions and loyalty. There is no longer a good reason to struggle with frozen turkey gifts. gThankYou! Turkey Gift Certificates are good for any brand and size whole turkey, at major grocery chain stores nationally. Recipients love having the ability to choose the turkey they want for their family. Instead of having your team spend time on frozen turkey logistics, they can spend it on what really matters – engaging employees and sharing heartfelt appreciation. Sharing new information related to this fascinating topic through our publications and blog has long been a priority and we’re proud to release this newly updated 2018 edition. 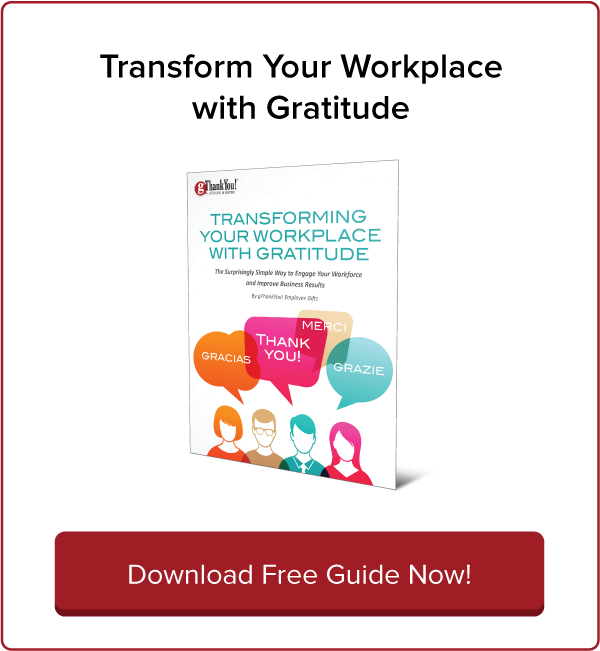 Since its introduction, our eBook on workplace gratitude has been a helpful guide for companies, large and small, as they learned to embrace an attitude of gratitude. Over the last five years, research has underscored the power of gratitude in our lives. 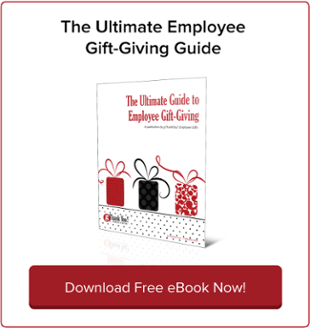 This growing body of research demonstrates that companies that make an effort to appreciate employees are among the most successful, most innovative companies in the world and have the highest rates of employee satisfaction and retention. Our original 2013 version has been completely rewritten with a focus on how to build authentic appreciation in the workplace today. While the key element in achieving that remains gratitude, the book is an exciting resource for businesses who are either curious to learn more as they embark on this journey or remain committed to sustaining a culture of appreciation. In his book “The Little Book of Gratitude,” the world’s foremost gratitude expert, Professor Robert A. Emmons, calls gratitude “the ultimate performance-enhancing substance.” Who wouldn’t want that in the workplace? Imagine what your work team could accomplish with a 50 percent jump in productivity. What if you could slash voluntary turnover by 31 percent? Part of the answer lies in just two words: “Thank you.” Experts agree that authentic gratitude makes all the difference. “Thank you” is more than good manners. it’s a powerful force that elevates employee wellbeing, loyalty, productivity and business performance. Not convinced? 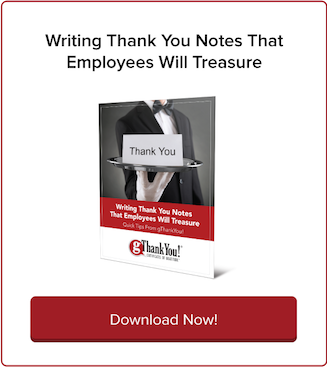 Download our free eBook and learn why leading business executives take workplace appreciation very seriously. We feel strongly about the transformative power of gratitude and think you will too! 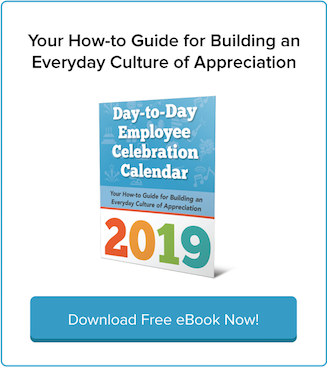 A lot of great things can happen in the next three months and this how-to guide will aid you in building an everyday culture of appreciation. Each month includes dates to celebrate and a mini-case study. October’s focus is on fun, November includes tips on writing a meaningful Thanksgiving Letter for employees and December delves into what our employees really want for the holidays. Fourth quarter is also a great time to plan for next year! We’ll be launching our updated 2019 Employee Celebration Calendar soon – newly updated and full of fun ideas and inspiration for your planning. It’s the perfect supplement to building out your employee engagement plans for the new year. Need inspiration to start on your 2019 planning? If the speed in which the seasons are changing is any indication, the holidays will be upon us soon and things will only get more intense as the fourth quarter approaches. Wouldn’t it be nice to be able to spend time with your own family and friends without the worry looming that you haven’t completed your employee holiday gift purchasing? Perhaps you’ll even be able to slow down enough to curl up with a blanket and a book about hygee, the Scandinavian pursuit of coziness and the celebrating life’s simple pleasures. Building a happy workplace is a priority for many employers. It starts with doing the fundamentals such as diversity, equality and fairness well. Embrace these and you’ll have the foundation needed for building a great workplace. Add a commitment to employee appreciation and you’ll create a happy, productive and loyal workforce. Rauch, when conducting research for his book, The Happiness Curve: Why Life Gets Better After 50, learned that happiness is local and relative. Although moral philosophers may wish Homo sapiens were wired more rationally, we humans are walking, talking status meters, constantly judging our worth and social standing by comparing ourselves with others today and with our own prior selves. Rauch further explained, “…people will tolerate and sometimes even embrace inequality if they believe the system is fair and lets them get ahead.” He described a witticism that is often attributed to Gore Vidal, “it is not enough for me to succeed; others must fail” as being “uncomfortably accurate.” Rauch cited a striking experiment, in which certain households in Kenyan villages were the random recipients of large financial windfalls. The lucky households were happy, but their neighbors experienced increased unhappiness because they felt as they had fallen behind. Finland came in number 1 in this year’s World Happiness Report – Nordic countries typically dominate the top ten. Freakanomics recently released a podcast “How to be Happy” addresses those questions and does a deep dive into Denmark’s consistently high happiness ranking. It’s definitely worth a listen (or a read since it’s also been transcribed). It includes engaging interviews with: Meik Wiking, CEO of the Happiness Research Institute in Copenhagen; Jeff Sachs, economics professor at Columbia University, special adviser to the UN Secretary General on the Sustainable Development Goals and co-editor of the World Happiness Report; and Helen Russell, journalist and author. What are the Happiest Countries? The U.N.’s World Happiness Report, which ranks 156 countries by their happiness levels and 117 countries by the happiness of their immigrants (and also serves as an antidote to our unhealthy obsession with Gross Domestic Product), is typically topped by Nordic countries. In 2018 Finland took the top spot as the happiest country. The rest of the top ten in order of overall happiness were Norway, Denmark, Iceland, Switzerland, Netherlands, Canada, New Zealand, Sweden, and Australia. Three words are key when it comes to employee appreciation according to Gallup’s results: honest, authentic and individualized. Read on to learn how digital feedback platforms can help make employee appreciation a daily work habit. Happiness in the workplace is achievable — and you can learn how. People who are happier at work are more committed to their organization, rise to positions of leadership more rapidly, are more productive and creative, and suffer fewer health problems. More and more, research is suggesting that happiness should not be an afterthought for workplaces; it should be an essential goal, entwined with the kinds of 21st century skills that are key to individual and organizational success today. And a key element of happiness in the workplace is gratitude. In fact, gratitude is a key element of happiness anywhere, according to decades of research on the subject. As researcher Sonja Lyubomirsky — author of the bestselling The How of Happiness and The Myths of Happiness — explains in this short video, gratitude does a number of things to pave the way for happy feelings. Building an employee wellness program includes exercise and diet activities, but should go beyond those, too. They’re still quite popular with businesses looking for perks that will benefit both workers and leadership. Per HR Dive, in a 2017 study by Virgin Pulse, 85 percent of employers surveyed said their wellness programs were good for employee engagement, recruitment, retention, and overall company culture. More than just offering exercise- and diet-related options, these programs are increasingly incorporating mental-health components as well. That shift has proven popular with employees, 85 percent of whom say they want help managing stress. That said, employee wellness programs are far from a magic bullet. Further research reported by HR Dive reveals that while 56 percent of employers think building an employee wellness program has made their employees healthier, only 32 percent of those employees concur with that assessment. And in another survey, 55 percent of employers claimed to offer wellness programs, but only 36 percent of employees said they were aware of those programs. If your company is interested in building an employee wellness program, you’ll want to think hard about what kinds of wellness are most meaningful to your workers. You also want to design a program your employees will actually use and that has practical benefits for the company as a whole. In an article about workplace friendships for L & D Daily Advisor, writer Lin Grensing-Pophal cites a Gallup Q-12 employee engagement assessment tool which asks the questions, “Do you have a best friend at work?” Why ask that question? Well, research by Gallup indicates that having a best friend in the workplace correlates with higher job satisfaction rates AND a reduction in the likelihood that an employee will depart to find a different job. Sadly, a New York Times opinion piece by Adam Grant indicates that the number of employees who say they have a friend (not even a best friend) in the workplace is declining.